SAN DIEGO — As boaters we usually gain knowledge from family, friends or professional instructors. As we continue boating, we soon learn from our own experiences – including occasional mishaps. Two of my more memorable lessons fall into that category. When Arv and I fueled prior to returning home from our Chesapeake Bay honeymoon, I stupidly wrapped a line around my hand to manhandle our heavy old Hatteras. Suddenly the wind picked up and pulled the line so tight I couldn’t release it. Fortunately the fuel dock attendant saw what happened and quickly loosened the line, allowing me to free my hand and save my fingers. My hand hurt for months, but I’ve never repeated that mistake. To prevent falls make sure you have adequate grab-rails on your boat – and use them. Twice I slipped and missed a stair while on our boat, tearing up my knees and requiring surgery. Now I’m extra-careful to use handholds while moving around the boat. Frequently I see both kids and adults with their legs hanging over the sides of underway boats, especially at the bow. That may seem like harmless fun, but it can turn tragic if a heavy wake hits the hull or someone’s leg or arm gets pressed between the boat and a piling or dock. That happened to a liveaboard woman at our marina. Her legs were crushed between her boat and a piling. I last saw her painfully navigating the marina ramp on crutches, following a long hospital/rehab stay. Avoid other boating mistakes by developing and adhering to common-sense pre-departure routines. Before taking your boat out, especially if you haven’t operated it in a while, always check out your engines, electronics and other critical systems, making sure they work properly. Check your coolant, engine oil and transmission fluid levels and look for any leaks. Test your engines and transmissions before departing. Never, EVER, release your lines without starting your engines (excluding powerless boats). I’ve observed many boaters stranded because they untied their lines before discovering their engine(s) wouldn’t start; they’d already drifted out of their slips and had no power to return. By the opposite token, don’t forget to release ALL your lines before powering up to leave your slip. I’ve seen cleats ripped from boats and docks because of too-hasty departures and forgotten lines. Remember, boats move, even at the dock, creating risks for injuries and accidents. Make sure your family and guests understand the old maritime rule to keep one hand to steady yourself and know what and where to grip safely. We’ve always enjoyed the wave action while anchoring out. But sudden boat wakes, including at marinas located on busy channels, can cause problems. We’ve often had to grab dishes and glasses to keep them from flying or sliding. 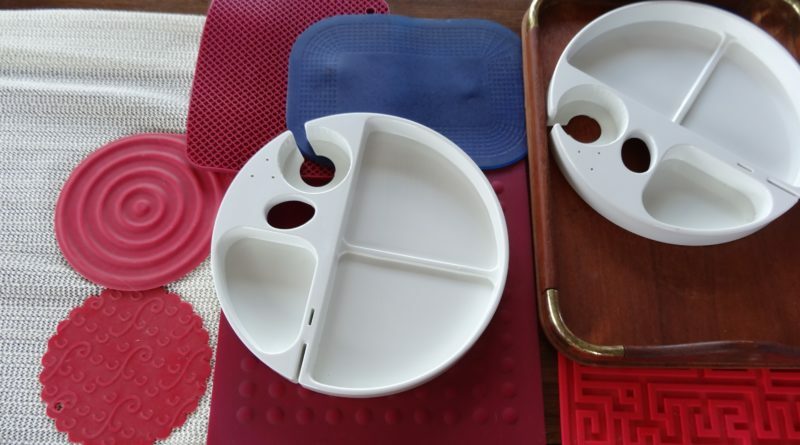 To avoid food spills we learned to use non-skid mats under serving bowls, trays with galleries and special plates equipped with wine glass holders. Sometimes we’ve even held our wine glasses with our toes. And for cooking on board consider using pot restraints to prevent them from slipping off the cooktop. Be sure to equip your boat so it can endure a good battering from heavy seas. Before leaving for a cruise, secure or stash anything loose. Use screws, sturdy brackets or museum putty to tie down and secure lamps, artwork, ornaments, galley appliances, televisions and electronics. On one unforgettable yacht club cruise we experienced unexpectedly rough weather, leaving every vessel with some damage from the intense wave action. With planning, self-awareness and adequate preparation you can prevent unnecessary on-board errors and make your cruising safer and more enjoyable. ← It’s all about the money: What’s the price of redevelopment?